With so many options to choose from, picking a Machu Picchu tour can seem like a daunting prospect. A trip to the Inca citadel is a once-in-a-lifetime adventure for many travelers, and booking a good tour can make all the difference. Here are some tips to bear in mind as you weigh the available options. The tourist high season in both Cusco and Machu Picchu runs from May to September, with June, July, and August being particularly busy. The next step is deciding what type of tour you want. There are various options available, so you should be able to find something to suit your schedule and your style of travel. Where to Start? Do you want to join a tour group when you arrive in Lima, or do you want to travel to Cusco independently and take it from there? Budget or Luxury? There are some luxurious Machu Picchu tours to choose from, but maybe you are happy with a simpler, less expensive option? All-Inclusive? Some tours include airport pickups, accommodation in Cusco and meals with your tour group. If you are a more independent traveler, you might not want all the additional extras. Extended Tours: A standard short tour will take you straight to Machu Picchu and then back to your hotel. Alternatively, book an extended tour package and spend a few pre-planned days exploring the numerous sites around Cusco and the Sacred Valley. There are two main types of tour companies, the big international outfits, and the Peruvian agencies based in Lima and Cusco. Both types have good and bad options, so size alone is no indicator of quality. Authoritative Independent Recommendations: Check the latest editions of well-respected guidebooks for reviews and recommendations. You should also look online, but make sure the information is current and the source is reliable. For a list of our own recommended tour companies, read The Best Inca Trail Tour Operators in Peru (all of which offer alternative treks to Machu Picchu and other tours in the Sacred Valley). Peru Travel Forums: Popular travel forums have plenty of recent Machu Picchu tour reviews and recommendations. Remember that one person's idea of quality may not match your own, and keep in mind that tour agencies sometimes write the posts themselves. Use forum recommendations as a starting point only; don't rely on one glowing write-up alone. Ask Other Travelers: If you are already in Peru, ask other tourists for recommendations. You'll come across plenty of people who have already been to Machu Picchu, especially in tourist hotspots like Lima, Arequipa and, of course, Cusco. By now, you should have a good selection of Machu Picchu tours from which to choose. Before making your final decision, check the finer details of each tour to see what you get for your money. Are train and bus tickets to Machu Picchu included in the price? 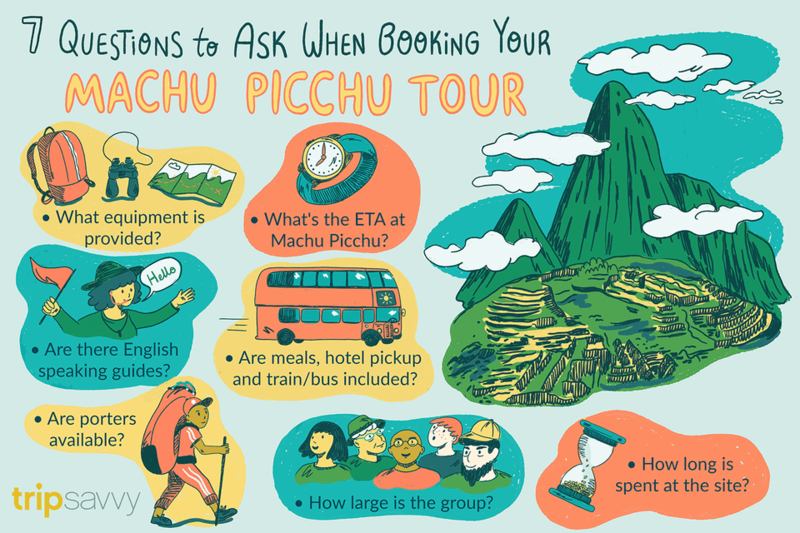 Is the Machu Picchu entrance fee included in the price? What equipment does the agency provide (sleeping bags, tents, stoves, etc)? Are daily meals and drinks included? Are porters or pack animals available? Extra Tip: If you are booking your tour in advance, call or email each potential agency with a question or two. The response might give you an insight into the standard of customer service and the agency’s overall attention to detail. With your search narrowed down to two or three reputable tour agencies, all that remains is to compare the prices, check availability and book your tour of choice. Booking your Machu Picchu tour in advance is always a good idea, and if you want to trek the Inca Trail, reserving a space, at least two to three months in advance is essential. You can book alternative treks and one-day tours when you arrive in Cusco, but you might have to hang around for a few days. Overall, it’s easier, more secure and much more reassuring to have your tour booked and confirmed before you arrive in Cusco.